Playing almost exclusively fingerstyle, Dan creates beautiful, intricate and innovative dulcimer and guitar music, sometimes pushing the boundaries of the instruments. 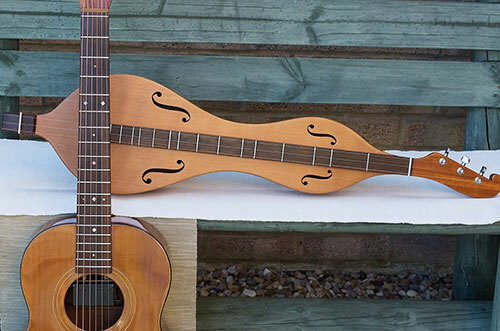 Dan’s instruments are bespoke and hand-crafted by master luthiers from the UK and USA. Unusually, Dan’s dulcimers only have 3 strings and a true diatonic scale. They are typically tuned to Ionian mode (DAA), not the more usual DAD tuning. He also uses modal tunings to play atmospheric music in medieval scales and he uses Bagpipe and reverse Ionian tunings to create a rich and resonant sounds on the dulcimer. Dan arpeggiates chords to accompany songs, interprets folk melodies as instrumental airs and performs his own imaginative compositions. The solid body electric dulcimer with a humbucking pickup away from the bridge gives a smooth, mellow tone. This signal is then treated with a wide variety of programmable digital effects, with each piece having its own texture. Dan has access to the same huge palette of high quality textures as does a modern professional rock guitarist. Playing a mixture of folk songs and instrumentals whilst including elements of medieval music and jazz gives Dan a unique guitar sound. Furthermore, Dan’s guitars are tuned to Open C tuning (CGCGCE) and to his own temperament (not a chromatic tuner) resulting in a powerful, resonant sound with a sweet, natural temperament. All of Dan’s acoustic instruments have pickups and the sound is subtlety treated with state-of-the-art programmable delay effects using the highest quality electronics. Each song has a slightly different sound texture, complementing the mood of the piece. The treatments are often stronger on Dan’s guitar music, which is especially innovative. The sensitive and highly musical use of programmable digital effects, allow Dan to create unique and rich signature sounds. Read more about Dan’s effects on his blog.